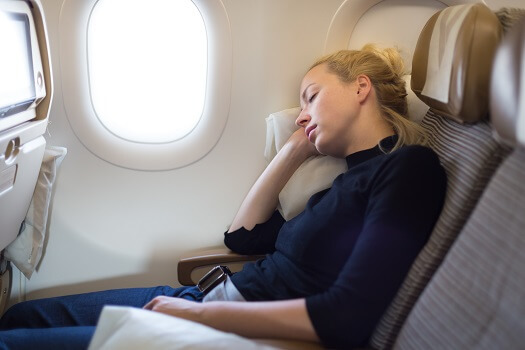 Whether you regularly fly for business or just occasionally for personal reasons, you’re likely well aware that soaring through the friendly skies sometimes results in neck pain. The good news is that most neck-related pain resulting from flying is often a temporary inconvenience as long as nothing structural is involved. You’ll also be pleased to know there are some steps you can take to reduce your risk of experiencing neck pain the next time you fly. Note: If you carry prescription medications with you, bring a note from your doctor (such as your Los Angeles spine surgeon) to avoid issues with airport security. Airline seats aren’t always designed in a way that will allow you to maintain correct posture. Other times you might find yourself next to someone who crowds into your space and forces you to get into an uncomfortable position. Prepare for these types of situations by bringing a travel-size neck pillow with you. A popular variation is designed like a scarf that allows the user to comfortably lean to one side while still getting sufficient support. It only stands to reason that if you sit in your seat and dwell on every instance of neck pain you might experience, it’ll be much more distracting for you. Instead, bring some distractions (e.g., magazines, an e-book reader, or soothing music on your smartphone or iPod) to keep your mind occupied. Sitting in one position for long periods can trigger neck pain when flying. When the seat belt sign is off, get up and walk up and down the aisle to stretch and get your circulation going. If you have a history of neck-related pain, consider taking a battery-operated neck massager with you. Popular devices look like neck pillows, except they provide a gentle massage, and some even have a heat-producing feature, too. If your airline doesn’t allow such devices to be used, a tennis ball can achieve similar self-massage results. Another option is to pack plastic bags that zip up so you can ask the flight attendant for ice if you develop neck pain while on your flight. Flying can often cause pain in the neck area, especially if it’s a long flight and your mobility is limited. Following the suggestions above can ease your pain and make the flight more enjoyable. If you’re having severe neck pain or pain on a regular basis, The Spine Institute is the place to call. Our spine experts can diagnose the cause of your pain and provide you with the most appropriate treatment, from physical therapy to ACDF surgery. Los Angeles residents should call our friendly staff today at 310-828-7757 to schedule a consultation.